The JOOLA Chen WeiXing blade is a high-quality defensive blade from the Chen series. It is designed by the company according to the playing style of the top Europe defensive ping pong player. The racket is just well suited for players who want good control. The defensive blade has always been one of the popular blades that produced by JOOLA. 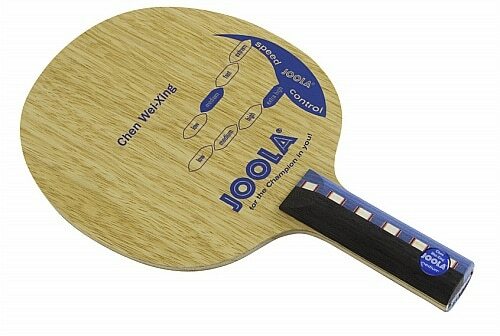 Now JOOLA officially designed and developed a modern defensive blade for Chen Weixing – who is one of the world’s best defensive players. This blade can control the ball well not only when the ball is chopped, it can also let the player to hit the fast and strong topspin. The ability to combine the two features is because JOOLA is adding a new “BLACK CLOTH” material to the blade. Which rubber is suitable for JOOLA Chen Weixin blade? The blade is built with 7-ply which include 2 Limba, 2 Koto, 2 Black Cloth, and 1 Kiri in the middle ply. With such a design, it can provide a very good balance between top screw shots and control chops. It is categorized as medium speed and extra high control. The weight is approximately 90 grams. The JOOLA Chen WeiXing is considered to be slightly top handle. However, there are a few elements that need to be factored in as well. With the oversize head along the way to the paddle may vary from an average size blade. Generally, it can be categorized as an oversize blade that having great center gravity handle. With input from the world-class defending player, the JOOLA Chen WeiXing is the perfect blade for modern defensive players. By having the larger head design, the racket can offers players with a lot more surface area to carry out their chopping stroke. In addition, it can also give you a very good performance in pick-hitting. The layers of Black Cloth offers a player with extra control for them to get hold with. The blade has an excellent speed that is required for players when they want to do a counter attack. There is no problem at all for them to perform a powerful smashing. You need to bear in mind that as the head of the blade is oversize, therefore it can become even heavier if you put two thick rubbers at both sides of the blade. However, there is one recommendation for you to solve the issue in case you’re having the concern with the heavyweight. The thing that you can do is at the time you want to attach new rubber on it, you can adjust and align the rubber slightly further away from the handle. By doing so, it will reduce the rubber mass on the blade. The JOOLA Chen WeiXing is a good racket that offers a player to play forehand loop to loop and also backhand attack (long pips). It has a good protective base, hard top layer, and a great spot that sustained a rebound. It is very reliable for anyone to play a defensive stroke. It can be washed down with a good distance, and a neat block of thorns under the grid on the table. If the force is relatively concentrated, I can generate a very low arc. The opponent is very uncomfortable with the shot that I drive, cause he missed out a lot of arc shots from me. I am basically playing the chop for my first shot. And I will continue to play the chop whenever I can. If a shot cannot be chopped, I will just smash it back. I seldom play with the block. The shot that I make are generally having a lower arc. It is also great for me to drive the ball. I can simply exert with little strength to do a drive and the ball will return to the opponent side. The reverse spin is also good. I do quite a number of reverse spin and the opponent just made a lot of mistakes to receive my reverse spin. Putting long pimples at the backhand is not bad. It has high fault tolerance the accuracy is high. Forehand is also okay, better than I expected, and it should be better for me to drive the ball after a period of time. In addition, the key to play long pimples with a shakehand blade is to rely on the forehand. If you relying on the backhand and not willing to move sideways, this can be dangerous as your opponent will adapt to your playing style very fast and they will beat you in no time. If you love to buy this blade, you can get it from Megaspin. For amateur players, I would suggest them to choose for more sticky pimples in rubber for their forehand. The DHS Celestial Pole 2 is the rubber I think is good for amateur players. The amateur players can try with the single long pimples rubber first, and then adjust the technical level without adding sponge. When choosing for rubber, it is considerable selectivity as not all long pimples rubbers are suitable for chopping. You need to figure out the rubber that best suits your playing style. Here are 3 rubbers that I would love to recommend for defensive players. This Cloud & Fog III rubber basically featured with soft, long, and thin. So it is not sensitive to rotation. The reverse rotation effect is good and the change of the carryover is obvious. Especially when performing chopping, the reverse rotation is very strong. The rubber is very durable. Although the price is more expensive compared to other rubbers, the quality is guaranteed. From the features, we can know that this is an extreme rubber. It is the softest among all the long pimples rubbers. It is very easy for you to do a backspin, and it is easy to score due to the strong sense of sinking. This is a long pimples rubber of 729. It has the characteristics of pimples out. The pip density is low, the size of the pip is smaller, and the pip hardness is much softer. This rubber is very insensitive to rotation, it is easier to deal with the arc. The trajectory is short, and the defensive effect is excellent. So for the chopper, the 755-2 may be significant. At the same time, because the height of the pip is considered short among long pimples rubbers, it is easier to be used to attack than other long pimples rubbers.